Sue Pearson received a Master's degree in Education from the University of Iowa in 1983 and a beagle named Jessie in 1986. Academia and the world of dogs collided in 1987, when Sue began teaching puppy classes and dog obedience for beginners with the Iowa City Dog Obedience Club (ICDOC). 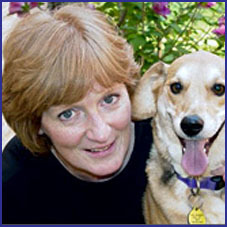 From 1989 to 1994, Sue developed and taught classes for pet dog owners through Kirkwood Community College and in 1994, created SPOT & CO. Dog Training. SPOT & CO. promotes dog-friendly training through the use of positive reinforcement, food rewards and games. Sue is a charter member of the Association of Pet Dog Trainers (APDT), an organization that promotes dog-friendly training, and has been a speaker at past APDT conferences. She served as Treasurer for the APDT Board of Directors from 2001-2004. During her tenure on the Board, Sue helped to create a separate Council for Trainer Certification, directed activities for the Scientific Task Force and was Board Advisor for the Education Committee. 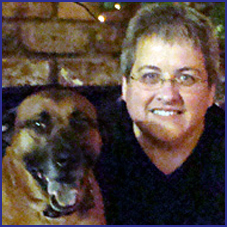 Sue served on an American Humane Association international task force charged with the development of humane training standards, and participated on the APDT Education Committee during the development of its trainer certification test. She is currently a member of the newly-established APDT Foundation. In 2006 Sue received the "Entrepreneurship Benefiting Animals Award" from the Johnson County Humane Society, and in 2007, she was named the Ian Dunbar Member of the Year by the Association of Pet Dog Trainers. Sue is actively involved with training activities for dogs and volunteers at the Iowa City Care and Adoption Center. She seeks to educate the public about positive training for dogs and provides demonstrations and seminars throughout the year for a variety of groups and organizations. Sue conducts individual behavior consultations and provides pet dog training for puppies and adult dogs, as well as classes in Agility, Canine Good Citizen, and Rally. With the assistance of the extraordinary trainers who work with her, they teach 12-14 classes each week, provide training to volunteers at the local shelter, and speak to college and university students, scout troops, and elementary school children about behavior modification and dog-friendly training techniques. Sue is also a contributing author for "Animal Tracks" in The Iowa Source, a regional news magazine, and for the Dog Star Daily website. She lives in Iowa City, IA. Judy has been blessed and educated by animals all her life. Contributing to her broad knowledge and love of animal behavior are her experiences with hand-feeding a baby robin, rescuing and raising orphaned opossums, and training a deaf, twelve-year-old beagle, Walter, who was found abandoned in a barn. Judy received a degree in Business Administration from the University of Iowa in 1993, and has spent over two decades training people with disabilities using non-aversive, positive training technologies. Fate led these two worlds—training animals and people—to merge in 1999, when she began working at SPOT & CO.
As a trainer at SPOT & CO., Judy teaches pet dog classes for puppies, beginners, and advanced beginners. She also teaches Rally and Agility classes. She has been active in designing and piloting classes for shelter dogs and volunteers for the Iowa City Care and Adoption Center. Her experiences and outlook bring a unique flavor to classes that are designed to help people and dogs have fun while learning to live, love and learn from each other. SPOT & CO. trains hundreds of dogs each year, promoting dog-friendly training through the use of positive reinforcement, food rewards and games. For her work with dog training, Judy received the “Entrepreneurship Benefiting Animals Award” from the Johnson County Humane Society in 2006. Judy lives with Georgia, a wonderful Russian Shrew Hound (a/k/a a beautiful, red mixed-breed dog), Samson, a yellow lab fruitcake; and BoBo, a silky terrier. She also shares her acreage with a flock of opinionated chickens! Lisa Pooley has been an assistant trainer with SPOT & CO. since 2000. Lisa became familiar with SPOT & CO. and the world of positive training when she adopted Murphy, a curly-tailed Shepherd mix, who was, at the time, in the throes of doggy adolescence. Lisa began volunteering at the Iowa City Care and Adoption Center in 1999 and co-founded the Friends of the Animal Center Foundation (FACF), a non-profit organization that supports the animals at the Center. She is most proud of helping to put into place (and co-coordinating) the Paws to Train program. Paws to Train, co-sponsored by FACF and SPOT & CO., provides dog training classes for shelter volunteers at SPOT & CO., gives vouchers to new dog adopters for low cost dog training at SPOT & CO., and gives shelter dogs the opportunity to attend a SPOT & CO. six-week beginner class at SPOT & CO. This provides a field trip and training class for the dog as well as great publicity for shelter dogs! Lisa is a member of the Association of Pet Dog Trainers. In 2006, Lisa was awarded the Dances with Dogs Humane Award from the Johnson County Humane Society, and in 2008, she received the Governor’s Volunteer award for her work at the Iowa City Animal Center. Lisa earned Master of Arts degrees in Russian and English literature. She shares her home with her husband, Justin, and her dog Diesel, a Cattle Dog mix who enjoys taking SPOT & CO. Rally classes with his girlfriends! Kristin Johnson joined SPOT & CO. as a training assistant in 2006, and she still can’t believe her luck! Dogs have been part of her family since childhood and she has a special affinity for Norwegian Elkhounds. Kristin has a B.A. degree in English, with minors in French and Psychology. By day she works as an editor and grant writer, but her favorite part of the week is going to SPOT & CO. class—especially on agility night. Kristin spends her free time working with the dogs at the Iowa City Animal Care and Adoption Center, where she has been a volunteer since 2000. Kristin uses positive training to help the dogs become more adoptable and has trained new volunteers how to interact with the dogs. She also participates in the Animal Center’s Paws to Train program, where volunteer trainers take Animal Center dogs to SPOT & CO. classes. In 2009, she was a recipient of the Governor’s Volunteer Award for her work with the Animal Center. Kristin shares her home with her lovable Labrador, Pudge and her snuggly Pit Bull, Simone. Jessica joined Team SPOT in 2009 after being in classes with her dogs (Onyx and Loci). She has always loved animals—for as far back as she can remember—and she grew up in a household with lots of pets. Jessica got her puppy when she was nine, a Samoyed named Boomer. In high school, while working for a pet resort, Jessica thought she would become a vet but realized that it was actually training that sparked her passion. She graduated from the University of Iowa with a B.A. in Linguistics and a minor in Psychology. She and her husband Corey have two dogs and two cats: Onyx, a giant Black Lab/Great Pyrenees mix, who thinks he’s a lap-dog and loves going to class; Loki, a Pit Bull mix, who has boundless love (and energy); Topaz, a black DSH, who believes she is queen of all she surveys (and might be right); and Penguin, a black and white DSH who acts more like a dog than a cat. Katie began working at SPOT in 2009 after extensive work at the Iowa City Animal Care and Adoption Center and with her own dog in classes. In addition to working on a degree in Classics, Katie knows most of the dogs in our area from her work at the shelter, SPOT & CO., pet sitting, and working at a boarding facility. 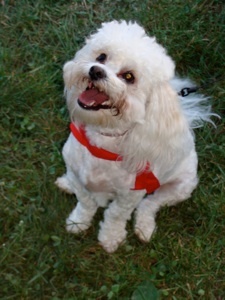 Katie is actively involved in the Pet Partners Program, as well as in community education. Her favorite pastimes are watching AFLAC commercials (seriously funny!) and training her dog to use the TV remote or pat the cat on command (when she isn't reading classical literature in the original Latin and Greek). Katie lives with Kaia—the wonder dog, and Skeeter—the dog-cat.